every year, weed inspectors from across the province gather for the Annual Weed Inspector’s Conference. Weed Specialist Mike Cowbrough, from the Ontario Ministry of Agriculture and Food (OMAF) hosted this year’s event. On the agenda: weed issues affecting the agricultural community, new tools for keeping track of invasive species, and a brief review of the Weed Control Act and enforcement cases surrounding it. The primary objective of the Weed Control Act is to stop difficult to control weeds from establishing in agricultural fields. On the top of the list of challenges are concerns about glyphosate-resistant weeds, particularly in field crops. Some will see yield losses as high as 80-90 percent. In the US Midwest, they are dealing with a species called Palmer amaranth, which is resistant to about five different herbicide groups. Producers have had to resort to pulling and hoeing. The species is very prolific as one plant can produce several kilograms of seeds – hundreds of thousands of seeds. 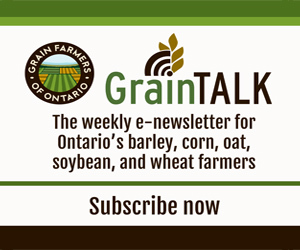 One of the big challenges for field crop producers in Ontario today, has to do with the boundaries by which the Act is enforced on certain species. These boundaries are based on biology. To understand how common ragweed spreads, for instance, you have to look at the pollen. Seeds travel as far as 100 kilometres away from the first plant. The more seed you produce, the more likely you are going to select for resistant weeds – and the more likely that resistant weed is going to spread. “That’s a game changer in terms of how you enforce the Act, right? Section 22: The Act doesn’t apply as long as it’s not impacting negatively on agricultural and horticultural land. So what’s the impact of glyphosate-resistant ragweed found in the middle of Hamilton, say?” asks Cowbrough. The second objective of the Act is to eliminate plants that are a host to either diseases or insects that affect the quality and production of food. European Buckthorn, for example, which can be found just about anywhere, is a host to stem rust in oats. “It’s also a host to other pests, like soybean aphid, which are tremendously detrimental to soybean yields,” says Cowbrough. The last main objective of the Act is to reduce the risk of plants that are poisonous; particularly those that cause skin irritations, dermatitis, or are poisonous if consumed by livestock. “How each weed inspector is able to perform his or her job is very unique to the region they cover,” says Cowbrough. The agricultural community, he says, is pretty clear when it comes to noxious weeds, though. They don’t want them anywhere near their property. Another web application was introduced at this year’s conference as well. Dave Copplestone of the Ministry of Natural Resources unveiled the EDD Maps tool or Early Detection Mapping System, a project that is a collaboration of the Ministry of Natural Resources, the Invasive Species Centre, and the Ontario Federation of Anglers and Hunters. The project is part of the Invasive Species Strategic Plan for Ontario, which places priority on recording systems, among other things. EDD Maps will help farmers stay on top of the spread of invasive species by providing in-depth information and clear images of specific species. It also allows users to report sightings, should they find an unwanted species on their land.